In this month’s column, Dr. Stern discusses the most common causes of onycholysis and its treatment. Onycholysis is a common disorder of the nail that results when the nail plate separates or lifts away from the underlying nail bed. When onycholysis occurs, you will notice that the normal white tip of the nail begins to extend toward the cuticle. When the nail plate separates from the underlying nail bed, air can get underneath and cause the plate to appear opaque or white rather than the normal pink color. In some causes you may see brown or yellow discoloration. Once separation has occurred, there is an opening where organisms such as yeast, bacteria, and fungus may enter and grow. Onycholysis has a number of causes. One of the more common causes is trauma, such as overly vigorous cleaning with an instrument beneath the nail plate. This can weaken the adhesion of the nail plate to the underlying bed. As we age, our nails do not adhere as well as they once did and the slightest bit of pressure, with an orangewood stick for example, can serve to lift the nail plate off of the nail bed. I like to make the analogy of a can opener lifting the lid off of a jar. Once a gap is created between the nail plate and the bed, exposure to chemicals, especially those in nail cosmetic products can further irritate the delicate nail bed tissue and cause separation. One of the biggest culprits is polish remover. We all know that polish removers contain solvents. These ingredients are safe to use to remove polish from the nail plate; however, they are not meant to come into contact with the surrounding nail folds and the underlying, delicate nail bed. When there is a gap under a separated nail, the polish remover will seep under the nail and bathe the delicate nail bed tissue. This process causes significant irritation to the nail bed and consequently prevents nail plate re-adhesion. Certain medications combined with ultraviolet (UV) exposure can cause onycholysis. The tetracycline antibiotics are classically associated with this phenomenon. For example, doxycycline, a common antibiotic that is used to treat acne as well as Lyme disease, can cause photo-onycholysis in combination with UV exposure. Clients who have UV gel manicures and who are taking this class of antibiotic would be at risk theoretically. Other drugs including certain chemotherapy medications can cause onycholysis with bleeding in the nail bed. This is an unfortunate side effect and it is very uncomfortable for the patient. There are several inflammatory diseases that can cause onycholysis. The most common is psoriasis. Psoriasis is an inflammatory, auto-immune condition that can affect the skin as well as the nails and joints. Onycholyis in psoriasis occurs because inflammation of the nail bed causes the nail plate to separate from the underlying bed. 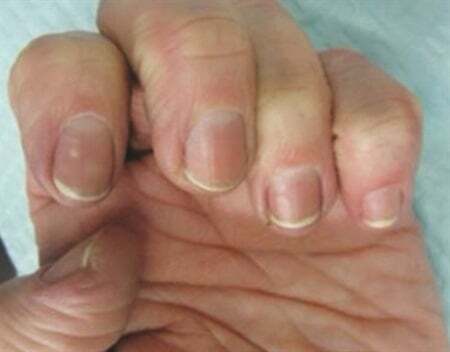 Nail injury is another common cause of onycholysis. This can occur on the toenails, for example, as a result of athletic activities. Sports such as skiing, tennis, and running can cause onycholysis of the great toenail. The toenail hits the front of the athletic shoe and develops a hemorrhage or bleeding so that the nail appears bruised. The buildup of blood beneath the nail will consequently lift the nail off of the nail bed. > Keep the nails clipped short. Do not file them. Filing the edge of the nail will put tremendous pressure on the separated area consequently causing further separation. > Avoid excessive water. Nail separation combined with water creates a warm, moist environment that is ideal for yeast. It is therefore advisable to wear gloves with wet work such as dishes and house cleaning. > Nail cosmetics should be avoided during the treatment period because, as previously mentioned, nail polish is particularly irritating to the delicate, exposed nail bed. > Do not clean under the nail, no matter how tempting. > Do not cover with bandages as they may increase moisture and growth of organisms. > It is important to be treated by a physician. Usually a topical anti-yeast solution and/or antibiotic will be prescribed. 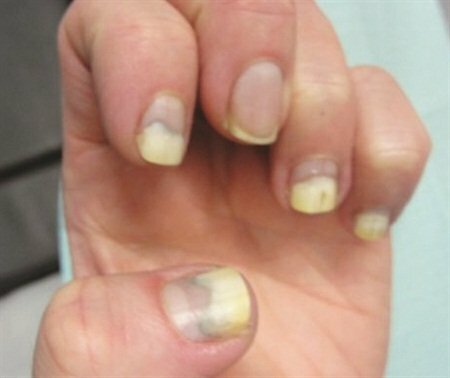 It is imperative that onycholysis be appropriately treated because once the nail separates, if the condition persists, it can become permanent and irreversible. It is therefore essential to refer a client with onycholysis to a physician. Nail separation can also be the first sign of psoriasis and by referring your client you may help to uncover an important medical diagnosis. Many women have a tendency to develop nail separation and, as I mentioned, it is often an age-related phenomenon. If a client seems to have this predisposition it would be advisable to avoid cleaning under the client’s nails with an orangewood stick as this normal routine can cause the nail plate to separate in those who are prone. Dermatologists treat skin, hair, and nails. I am a board-certified dermatologist and I specialize in the treatment of nail disorders including nail infections, inflammatory diseases of the nail, cosmetic issues related to the nail, cancers of the nail, sports-related nail injuries, and nail surgery. Most of my consultations are from other dermatologists, physicians, or patients who have read about me and I also see patients referred from nail salons. I view my relationship with nail technicians as a partnership in that we are all trying to do what is best for our patients and clients. I am always happy to collaborate and to offer my expertise, and the relationship is reciprocal, as I enjoy learning from nail technicians as well. You can contact Dr. Stern with your questions via Facebook (www.facebook.com/danasternmd) or Twitter (@DrDanaStern). 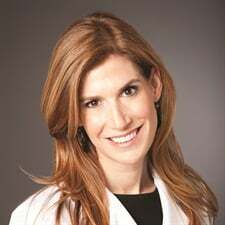 Visit her website at www.drdanastern.com. The Nail Tech Networking Event of the Smokies is a yearly event held in the Smoky Mountains.